I went to Fort Lauderdale for a very quick trip to see my friend Stef who recently moved down there. It was a fun girl's weekend. 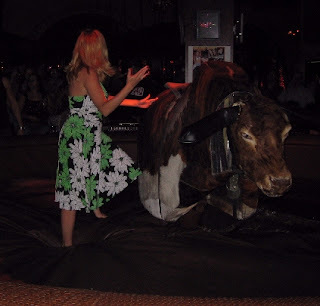 One of the many highlights being that I rode a mechanical bull for the first time at Seminole Hard Rock Casino's Tequilla Ranch. Let me preface this story by writing that yes, I had a glass of champagne and wine before hand, but I've always wanted to take a turn on one of these ever since I saw Urban Cowboy as a little girl. It was crazy though, a lot harder than I expected, especially when in a dress and the guy at the controlls is being dirty about it. Let me break it down for you. 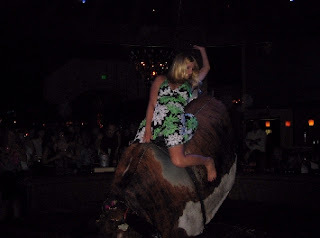 Here I am trying to figure out how I was going to jump up on this thing with a dress on and a crowd watching. It was pretty high. I was a little embarrased and nervous, but I figured what the heck who did I know down there? Now, I am just trying to hold on, gripping the sadle strap, while the guy at the controls is jerking the bull rapidly left and right trying to cause me to well, pop out. I was screaming, laughing, and just trying to hold on. When it looked like the guy might succeed in his task, I figured it best to just fall off. Yes, I volunteered on this fall, I had had enough of the close peep show calls. What a ride though, it was really fun. When I fell the second and last time, controller guy had the bull's head nudge me, which had everyone laughing. I swear my thighs were sore the next day.